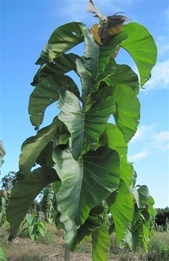 If you are considering becoming a teak farmer in Belize you will have certain questions which we will try to answer. You may think that teak is a very slow growing tree that will take forever to produce marketable timber, but in reality teak grows quite fast and can already start generating income after 5 - 7 years! In this section we will explain in more detail the facts and figures of future projections and try to put them into the right perspective. You can profitably harvest and market the timber anytime after ten, fifteen or twenty years. It is generally accepted though that a twenty-five year rotation of a teak plantation is the most economical way of production and will give the highest return on your initial cost. If you do research you will be bombarded with lots of estimates and projections. Always try to compare apples with apples though. Some calculations include future increases in value, based on past price increases. Although we think that a globally prized commodity like teak is a great protection against future inflation of the U.S. dollar, we have not taken inflation nor price increases into our estimates. Very likely inflation will happen for many reasons and the prices of teak in twenty years will look quite different then what we currently see based on historic price increases. A product like teak, which is and will be in high demand cannot be produced in a short period and is not likely to be subject to market saturation, which always leads to lower prices. The reason that there are so many different numbers quoted is due to all the variables that operators have no control over as well as offers based on different values. Some offers include the purchase of the land so you will have to be aware of the additional cost involved in owning real estate in Belize, such as GST (12.5% General Sales Tax), property taxes, possibly surveying cost and closing cost. Decide if you are buying the land for real estate purposes or for the production of teak. Other companies will sell you shares in a Teak Company in which case you will have to deal with management rather than with teak trees. There are offers that require a large initial investment. There are numerous reasons that one wants to get involved with teak plantations. You may want to grow teak for ecological reasons to save the existing National Forests where cutting of trees is still continuing and changing the habitat for all creatures in the forest. You may want to grow teak as a way of saving for the future of a child or grandchild, or you may see it as an excellent investment far exceeding other opportunities like 401(K) or money market funds, especially since teak is a commodity with a great hedge against inflation. If the value of the U.S. dollar drops due to inflation or market pressures, it is good to know that teak is a global commodity and is marketable in any currency. And there is the excitement of actually being an owner/farmer of a teak plantation in Belize! To prepare for planting we deep-rip the soil where necessary and possible and break up the sub-soils to make it easier for the tap roots of teak to penetrate into the deeper ground when reaching for water. This is especially important for growth in the dry season. We make sure by applications of lime that the soil is adjusted to the proper Ph since teak prefers an alkaline soil. 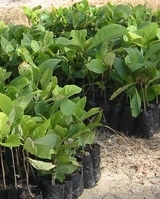 We plant during the rainy season and fertilize the trees when needed. Applications of proper fertilizers at the right time in the right amount have shown an increase of up to 150% in timber production. Irrigation may be needed, especially during the first couple of years to insure a fast start. Once the trees are big enough to produce ground litter, the need of fertilizing disappears. It is interesting to note that teak trees provide their own fertilizer by the natural composting of their own leaves. Teak is a deciduous tree and grows enormous large leaves in the early years. The first five years of growth will determine greatly how robust the tree will grow and how much timber it will provide. In Nigeria under good growing conditions an exceptional production of 10 cu meters per acre per year was accomplished. In Tanzania the best plantations were producing 7 cu meters per year per acre. In Belize it has been reported that 8 cu meters per year per acre is possible. These production numbers are based on a 25 year rotation and are calculated by dividing the total timber production per acre by 25. In Belize that would result in more than 200 cu meters of teak. The ITTO Tropical Forest August 12, 2010 report listed the value of teak logs imported into China between $1,200 - $1,500 per cu meter of logs. Here are some gross production figures per acre in Belize based on a 25 year crop rotation with an expectation of 200 cu meters of teak per acre. Calculating the above mentioned lower price of $1,200 per cu meter (not the $1,500) the gross production may result in $240,000 per acre of logs. These estimates are based on the current prices and do not take into account any inflation or potential price increases. It is hard to estimate the exact cost of harvesting especially 10 - 20 years into the future, but depending on the age of the wood the current estimates are in the 10% range. Other cost may include transportation to Miami or the Orient which are estimated at 2 - 5%. The net return could be $240,000 less 15% equals $204,000. These figures do include the thinning of the trees at year 7 and year 14. In this scenario the original $5,800 will exceed a 15% compounded interest return! Current information shows a great potential for teak if these MAI's (Mean Annual Volume Increments) can be achieved. However, these reports do not always compare with the actual field reports. Researchers believe that the difference is to be found in the well-run and high producing plantations where special care is given to the teak in the first couple of years. If you figure that the poorest locations in India and Indonesia only show a production of 1 cu meter and 2 cu meters, respectively, then it is important to realize that the difference in climate, soil and management makes a tremendous difference in the return on investment. So it all depends on these three factors: soil, climate and management. In order to understand what can be expected, a person should focus on the first five to seven years as being the most important period in the growth of a teak tree. We are currently planting close to 200 acres in teak for our own production. Owners of Flower World, Inc.